Is Michelle Waiting in the Wings? RUSH: Jackie in Ramona, California, wanted to get to you very quickly. How are you doing? RUSH: Fine and dandy. Great to have you. CALLER: Good. Good. You do a great job. Keep it going. We’re so proud of you. Thank you so much. CALLER: Yes. I’m originally from Illinois. I wanted to put that out there. My husband and I have been watching this since about 2003 just unfold with this whole Obama debacle. And as time is going on, we’re believing what we were thinking. We’re watching the left Democrat candidates become more and more radicalized. Well, we believe Michelle is gonna swoon in and save the day for the Obamas. RUSH: You know, I think that you are on to something. I think that it is entirely possible that the Obamas are sitting out there lurking in the weeds. Her book is still out there. They are waiting for these people to eat themselves alive, these other Democrat nominees, and chew themselves up with this radicalism. 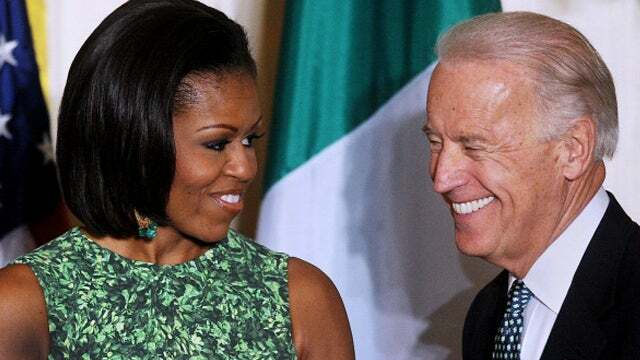 I wouldn’t be a bit surprised if there is a grand strategy for Michelle (My Belle) Obama to swoop in and save this party from wherever the hell they think it’s going because he wants back in the White House.